Though I was born in Neuilly, a residential area of Paris next to the Bois de Boulogne, the familiar sceneries of the Ile de France and close by Normandy held no great attraction for me. The first revelation of earthly beauty came when I was about six years old and traveled overnight on the Blue Train with my grandparents to the South of France in February or March. 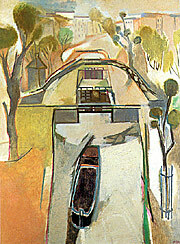 In the early morning when I woke up and looked through the window at the passing scenery, I admired almond trees in bloom, rose-ocher houses covered with pink Roman tiles, silvery and turquoise olive trees, dark slender cypress, planted in lines to protect the fields from the wind and tortuous leafless vines clinging to the red soil. Right away I told my grandparents that this was my place and my landscape. My initial enthusiasm and the feeling of belonging to the South, to its shores and countryside never left me. And later grew to encompass Italy, Tunisia, Greece and Egypt. The only exception to my predilection for Mediterranean sceneries in Provence or in the Languedoc was my landscapes of Brittany with its liquid blue light or the entangled trees, rocks and ponds of the Fontainbleau Forest. Many of my first landscapes of 1941 and 1942 were unsigned and have been lost. Strangely enough, I was in the habit of writing in a notebook the title, dates and dimensions of most of my works, though I didnt make photographs. Yet because of these embryonic archives, Ive had some pleasant surprises. For example, a few years ago I received a letter from a couple from Aix-en-Provence asking me if I had ever worked on a landscape of sunflowers in a vineyard. I asked them to meet me in Paris during my next trip there, and to bring the piece for me to see. There was a mention in my notebooks of two such canvases painted in 1942 1943. So a few months later these collectors came to show me the picture they had found in a junk shop close to Aix. Indeed, it was one of the two Sunflowers and Grapes (1942-1943). I had been seduced when observing sunflowers planted among the vines. I fed my eyes with the sharp contrast between the purple grapes and the yellow-orange of the large blooms on a bright turquoise sky. The canvas was unsigned but a stretcher bar bore my name. 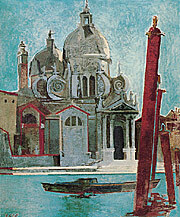 After Luc Simon and I were married, we traveled together to Venice during the summer of 1955, and right away both of us set to work in our distinct styles and looked for pictorial viewpoints of the canals, the gondolas and the monuments. The rose haze that seemed to soften all contours intrigued me. La Salute, Venice (1955) is from that time. The warm mists were not lacking either in May of 1956 when Luc and I spent a month in Tunisia, mostly at Sidi-Bou-Said, but also in Tunis, Hammamet and Kaiouran. The warm steam inside the hammam, where a friend accompanied me, enveloped people and things in an opalescent mist, and it became an important subject matter for me in 1956. During the same year, I also painted from memory the souks, the Berber Nomads, the children in the streets carrying younger children on their back  a native life soaked in light. All these animated street scenes seemed strangely familiar to me. In 1957, after experiencing the rainbow colors of Tunisia, I had to go back to the subtle Parisian grays, the banks of the Seine near Notre-Dame and the Saint Martin Canal. I had already tried unsuccessfully to capture these in the 1940s but had been unable then to define their specific character in a personal idiom. The Canal St. Martin with a Barge II (1958) is typical of that period. From the atmospheric grays of Paris, I then progressed without difficulty to the light of London that I studied first from nature in watercolor and from memory on canvas from 1959 to 1961. The Blue Cupolas (1966), an image of a Greek Orthodox monastery surging from blooming yellow mustard fields, is no longer just an evocation of the joy of springtime in Greece, but also an invocation to the divine aspect of a landscape. The same is true for many marine scenes and the boats that cruise my paintings during the 1970s and 1980s. While expressing my experience of sails, wind and sea, I remember the future, as it were  of what could be of imaginary vessels on is hoping to see. A vision is created by weaving together scattered fragments -- part memory, part imagination -- and making the whole as plausible as it is in dreams. What counts is to unify a fervent delirium and to give it a semblance of reason by using an impeccable inner logic. At times, it seems that I am observing the blooming of red poppies in a wheat field, or a palace in Rajasthan, the walled gate of a village in the Languedoc, the pink tonality of a street in Assisi, or that I remember the intense green of moors in Brittany or the more exotic sight of feluccas on the Nile. Yet all of this is invented and has more to do with what I felt or thought about reality than from the direct testimony of my senses. This is not so much the process of sublimation, but a poetic activity in the archaic meaning of that term, or, more precisely, an alchemy of inner life and the outer world revealed in a pictorial idiom. I am perhaps chasing an impossible dream, but mostly I want to surprise myself and to celebrate on the canvas an alliance with the unknown that allows me to discover the as yet unseen or even the invisible. For sure, the as yet unseen must exist somewhere at the outer margin of the visible, or else it must be invented to create new possibilities for the future. Perhaps I build castles in the air and can even live in them thanks to my work as an artist. This is more satisfactory than owning actual mansions where the plumbing doesnt work and other appliances are faulty. Because my daydreams are actualized on canvas, I dont feel the need for earthly possessions, and hotels are good enough if I am in need of holidays. During her honeymoon in Venice, following her marriage to Luc Simon, Gilot began a brief period of classicism working directly from nature. This was part of a most formative period for Gilot during which she gained greater insight into her own style while purging herself of what she felt were habits acquired during the preceding period. Although this stabilizing cycle lasted until 1960, this direct approach from nature was short-lived and essentially confined to the year 1955. This is one of the finest examples of a small series of works Gilot painted of Parisian landscapes and it is typical of the almost translucent works she created in the late 1950s. Confidently exploring the often capricious properties of painting with only thin layers of color, Gilot allows light to penetrate the top glazes of paint, causing those underneath to take on luminous qualities and hues unattainable from a single color or layer of pigment. Manipulating tone on tone, pinks on greens, gossamer glazes upon complimentary glazes, Gilot uses a modern idiom to reinvent a classical technique. The saturated colors of the foreground fade and recede, eliminating the reliance on a vanishing point. Defining each plane in space with subtle, harmonious half tones, Gilot deftly constructs a color rather than a lineal perspective.